We love Legos in our house! Legos are some of the best toys on the market in terms of play value for the money. Plus they last forever; my mother-in-law still has my husband’s Legos from his youth, and they certainly would work with today’s sets. From what I understand, Lego lovers are split into two camps: the instruction manual followers (like me) and those who prefer to build their own free-form designs (my children). I have to admit, there have been times I’ve spent hours after the kids are in bed rebuilding a Space Shuttle or some elaborate Star Wars vehicle that’s been smashed into bits and modified. I’ve now realized that’s an exercise in futility, and I’ve pretty much given it up. However, whenever the boys get new Legos, they do let me build the sets from the instruction manual at least once. Anyway, everyone in my house was thrilled when my eldest picked a “Lego Mars party” as his birthday party theme. There are so many great blogs out there with ideas for Lego parties, and I’ll share more ideas that I’ve borrowed and modified later in the week. 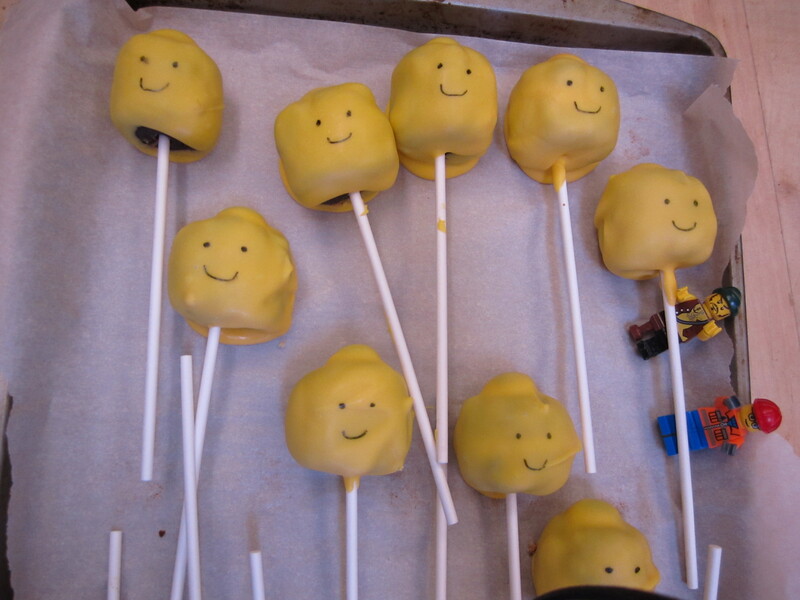 However, my first task was a true labor of love: Lego minifigure cake pops. Before you begin: Line 3 cookie sheets with wax paper or parchment paper. 1) Bake the cake according to package directions. 2) While the cake is still warm, crumble it into a bowl, mash it up with a fork, and mash in the container of frosting until well mixed. 3) Using a tablespoon-sized disher (or melon baller) scoop out tablespoon-sized scoops of cake/frosting mix. Roll into a ball, and form into the shape of a large marshmallow. 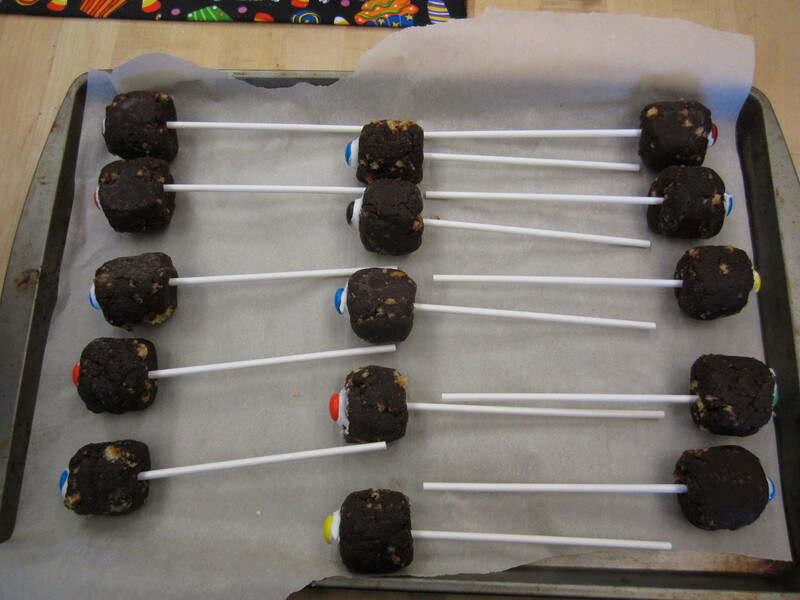 4) Insert lollipop sticks into one of the flat ends. 5) Attach an M&M to the other flat end in the center using frosting (I used Wilton’s Royal Icing mix from Joann’s.). 6) Put your cake pops in the freezer for a couple of hours. 7) Melt the candy melts in a bowl according to package directions, and swirl each pop in the candy coating, letting the excess drip back into the bowl. Lay the cake pops back on the parchment. 8 ) Once the candy shell has hardened, draw minifigure faces using food decorator pens. NOTE: The cake pops really need to be kept in the refrigerator until you are ready to eat them. These are far from perfect, but I’m excited to hand them out in the goody bags. Stay tuned for more Lego love. I think they look pretty good, Kirsten! BTW, in my house, I am the ONLY Lego instruction-manual follower.